The Jeep brand is 75 years old, and to celebrate this important milestone, Fiat Chrysler Automobiles is releasing special-edition versions of each Jeep model. Every 75th Anniversary model will offer a Green paint colour choice, with low-gloss bronze alloy wheels, bronze and orange accenting as well as appropriate badging. Inside, the festive Jeeps get exclusive seats with embossed 75th anniversary logos or Ombre Mesh fabric. 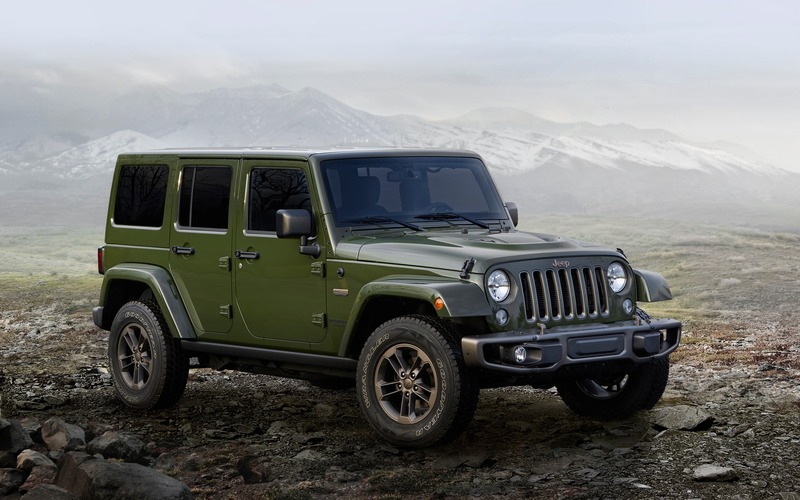 The 2016 Jeep Wrangler and Wrangler Unlimited 75th Anniversary edition are based on the Sahara trim level, and the package costs an extra $4,995. Paint colours include Sarge Green, Black, Mojave Sand, Bright White, Billet Silver Metallic and Granite Crystal Metallic. They also receive 17-inch wheels, a power dome hood, heated leather upholstery with mesh inserts and more. The 2016 Jeep Grand Cherokee 75th Anniversary edition package costs $2,995 over the price of a Laredo variant and $3,995 more than a Limited. It’s offered with Recon Green, Brilliant Black, Bright White, Billet Silver and Granite Crystal. The package also boasts a unique front fascia, 18-inch (Laredo) or 20-inch (Limited) wheels, Gode-Tex with mesh inserts or leather-clad seats and more. The 2016 Jeep Cherokee 75th Anniversary edition starts at $2,495 over the price of the North trim level. It’s available in Jungle Green, Alpine White, Black, Omaha Orange, Mojave Sand, Glacier Metallic, Granite Crystal and Anvil. It gets 18-inch wheels, a BeatsAudio sound system and a MySky Open Air roof. The 2016 Jeep Compass 75th Anniversary edition package costs $1,395 over the price of the High Altitude trim. It’s offered with Recon Green, Black, Bright White, Billet Silver and Granite Crystal paint colours, in addition to 18-inch wheels, leather upholstery with mesh inserts and a 2.4L engine matched to a six-speed automatic transmission. The 2016 Jeep Patriot 75th Anniversary edition also costs $1,395 over the High Altitude trim. It gets the same colour options and powertrain as the Compass as well as 17-inch alloys and other features. These diamond-anniversary models will be on sale in Canada early in 2016.